It’s already been a week since I sat under the Cottonwood trees at our Longhorn Ranch campsite as falling cotton gracefully swirled around me like snowflakes and three horses grazed across the pond. 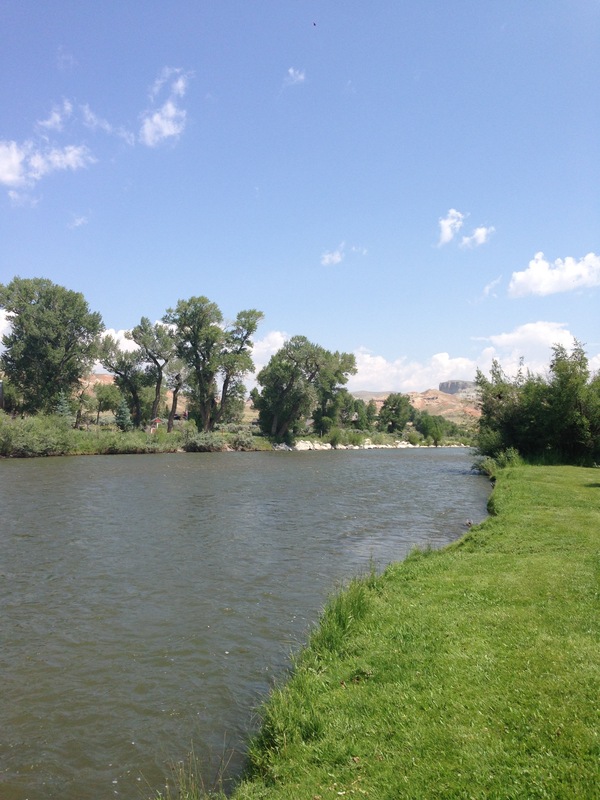 We stayed five nights in that lovely RV park, which was just 2 miles to the old-west style town of Dubois (Do-Boyz), WY (population about 1,000). During our stay, we had campfires every night, made several new friends, celebrated the 4th of July with a small town parade, went to our first local rodeo, enjoyed much needed massages, ate out a few times too many, and went on a couple adventurous drives. 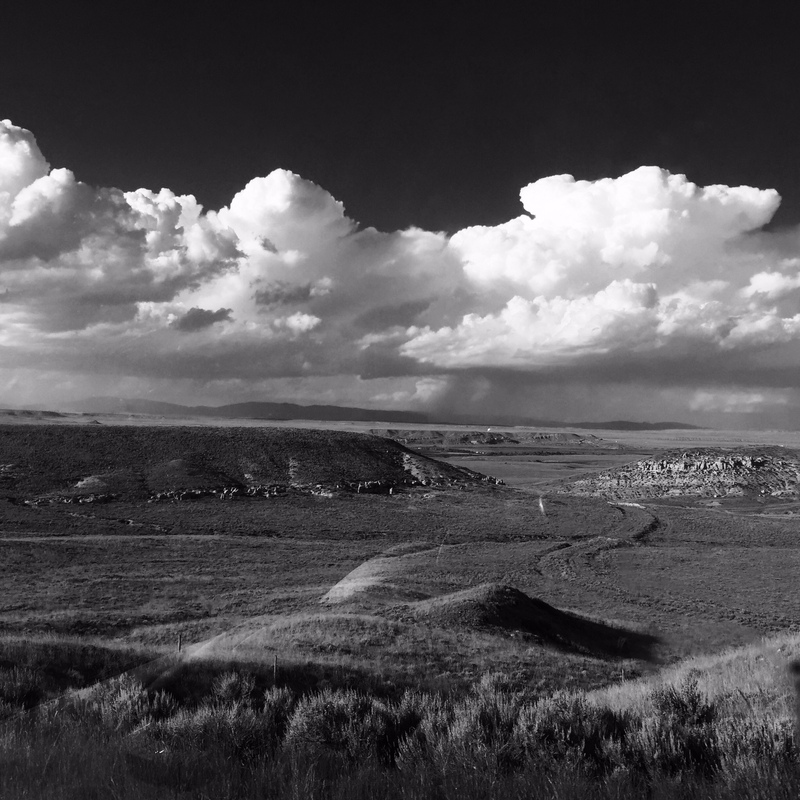 Dubois is basically in the middle of nowhere; most people just pass through the valley on their way to or from the Grand Tetons, but it’s also where badlands meet forested peaks, where real cowboys work and play, and where the beautiful Wind River winds through. To be honest, we were a bit disappointed in the feel of the town center; we had been expecting it to be a rustic Old West place with log cabin style buildings, but it seemed to lack some of the charm we hoped for. However, we also learned that just 7 months prior, a significant portion was burned down in some kind of accident, so the “newer” feel we experienced was for good reason! When we arrived at Longhorn Ranch around 8pm after a long drive, we were pleased with our spacious site location, as it was right across from the playground and backed up to a pond and horse pasture. After a long day stuck in Cheyenne and then a lengthy drive, it was worth the later bedtime to let the kids play as the sun set! It also gave me a chance to make a quick supper out of egg salad (sandwiches and lettuce wraps) and broccoli sautéed/charred in coconut oil – I thought it was yummy but the kids were unimpressed. We also immediately made some new friends. First, our neighbor, Dan, who has been full-timing with his wife for 11 years, proved to be informative, helpful, and sometimes quirky – we enjoyed him! Then, just as we were heading in, a couple of women introduced themselves (Tina and Debbie) and mentioned that they had noticed us a couple of weeks ago at Mountaindale in Colorado Springs! We thoroughly enjoyed their company too, and even had a full night of adult conversation with them our final night, as we drank wine and port by our fire pit (although, i think it’s possible they thought we were a bit nuts to be traveling with kids and dogs, and quite likely found us a tad too desperate to have adults other than each other to chat with). Our first day there, I woke up in a foul mood. There are many challenges living in less than 300 square feet – for me, not getting any down time tops the list, and 3 weeks into our trip, it had caught up with me (okay, okay, it’s possible PMS contributed too). Whatever the cause, I was short tempered and irritable all morning, especially with sweet Nina. We were in “why?” hell with Nina for a few days. I don’t mind the normal, inquisitive “why” game – occasionally it is mildly irritating and challenging, but I also love the information seeking. In contrast, the “why, Mommy?” to Every Single Thing I Say or Every Request I Make really pushes my buttons. Now, I’m a sensitive person and I recognize that this entire experience is overwhelming for her little mind, and the issue might be some form of control seeking disguised as “why” “why” “why???!! !” But OMG, PLEASE STOP! So anyway, we got through the morning – Raj took pity on me and let me have an hour of quiet, putter-around time in Gypsy while he took the kids to the playground. It helped but didn’t cure me. 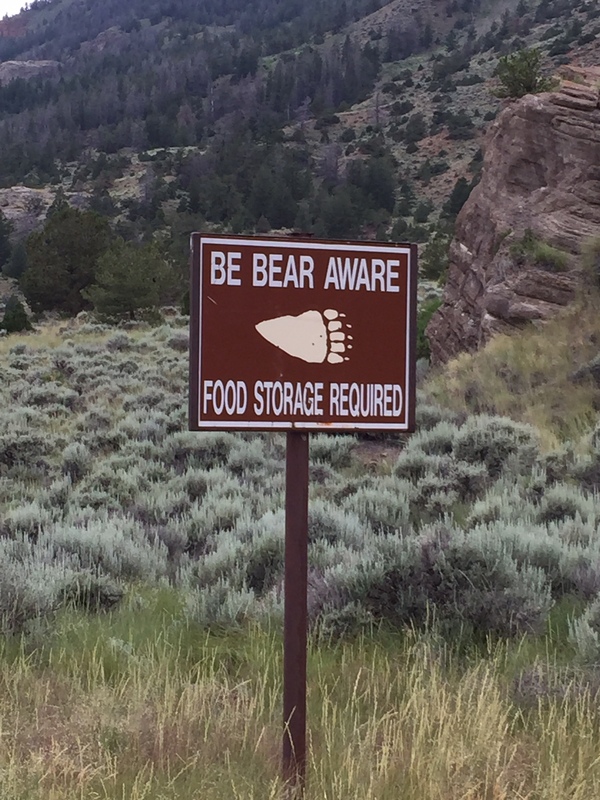 We went to town and ate a bunch of fried food and had very odd service, and then went to an outdoor gear store and bought some bear spray and bells for the dogs to wear on hikes – we are officially in bear country, with both black bear and grizzly bear sightings and interactions more common than I’d like to fully comprehend! Raj thought I was nuts, but I feel the spray and bells could have been the best $40 I’ve ever spent (we do hike with 2 toddlers after all and will be in bear land the rest of our trip). 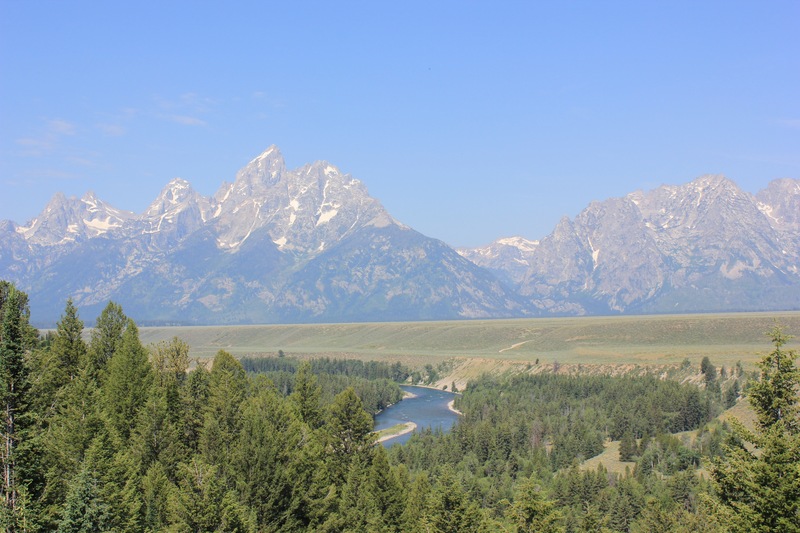 I wasn’t too inspired by the info on hiking in the area though, so we decided our priorities were a day trip to Jackson, WY and the Grand Tetons, the local rodeo, massages, and the 4th of July parade. There were some ups and downs during our day to Jackson and the Grand Tetons. The 1.5 hour drive there was fairly peaceful, as we let the kids indulge in huge blueberry muffins and had beautiful scenery. However, as soon as we found a place to park in Jackson, things got overwhelming for a bit: Nina had to pee (but she’s anti- any potty with an auto flusher), London was wild, Chai chewed through her leash while I stopped London from running into the street, and it was really hot! Despite a chaotic 30 minutes, we enjoyed walking around the bustling, dog-friendly town and soon found an authentic Mexican taco stand and shared salmon and pulled pork tacos. Since we had the dogs, we decided to take the kids to a large playground in the middle of it all; it was so nice to sit on a bench and watch them run (for the 2 minutes before they wanted to be pushed on the swing). We couldn’t stay in Jackson long because we had a long drive home and we didn’t want to miss the rodeo, but we agreed we’d love to return for a proper visit, hopefully a ski trip! We grilled steaks and peppers before heading to Dubois’ weekly rodeo! Though it was super crowded and we weren’t the only tourists (probably their busiest night of the year, as it was July 3rd), it was very much typical Friday-night affair for the locals. We arrived just before sunset and found a place to sit low in the bleachers, so our view was a bit obstructed by the railings, but still close to the action. After the opening remarks, national anthem and prayer, we watched the women and girls (some as young as 7 or 8!) barrel race, and I loved not only the sound of the hooves in the dirt and the cowgirl hats flying off as they galloped, but also how the crowd cheered for the successes and even more for the teams who’s horses just wouldn’t cooperate. It was a supportive community. London caught on fast and loved clapping and cheering; Nina, hooked on horses after her pony ride, watched wide-eyed as she shoved handfuls of popcorn into her mouth! Some of the rodeo events were more exciting than others, and we felt uncomfortable during the goat-tying portion, yet the sportsmanship was still impressive. 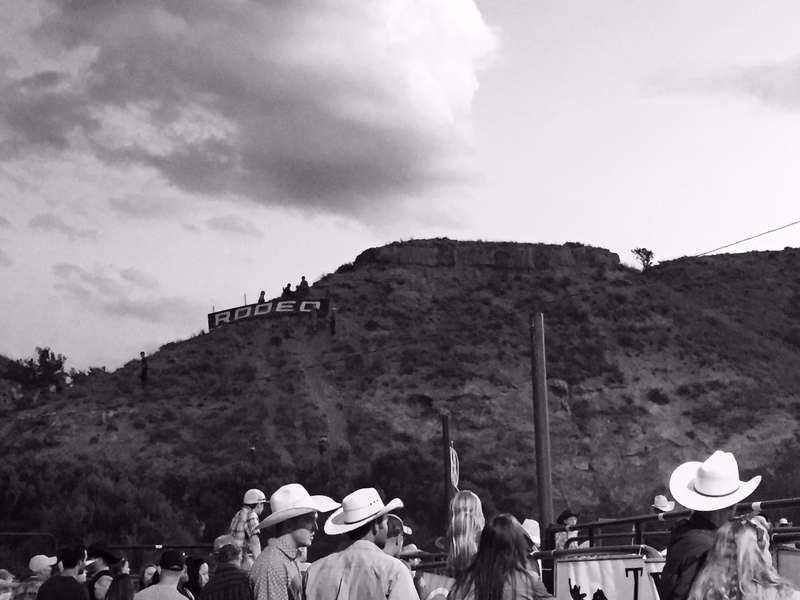 For our first rodeo, we all really enjoyed it! The morning of the 4th of July, we enjoyed a quiet morning playing outside, cooked bacon and omelets and lay around. The annual parade in the afternoon was a highlight, and Nina glowed as she chased after thrown candy. I can’t claim to have visited many parades, and this was certainly the first in a small town and a first with the kids, but I can honestly say it was the most fun I’ve had at such an event. 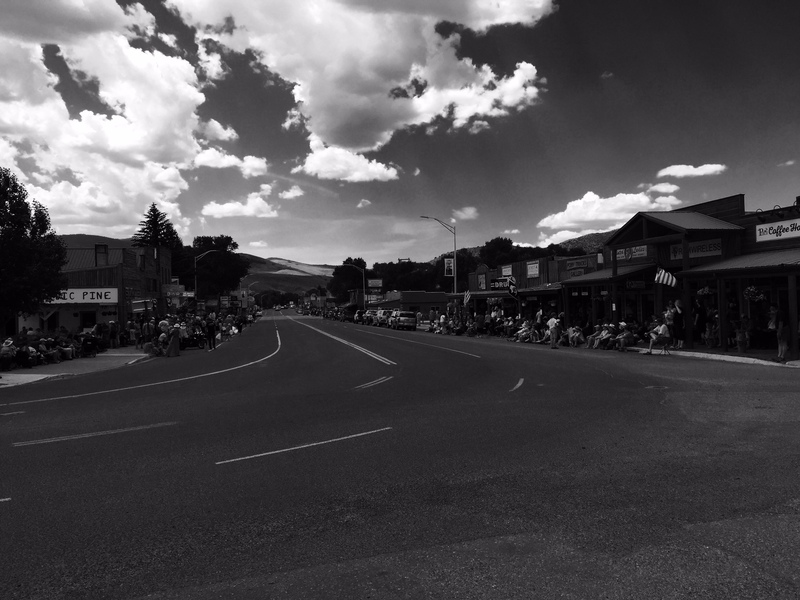 The small town vibe of this parade was the best part- there weren’t fancy floats or fancy people – just a community that loves their town and their country. If you ever have the chance to go to their parade, I recommend it, just be careful to avoid the fire hoses drenching the crowd at the end! Our final full day we enjoyed an exceptionally lazy morning watching movies because storms moved through. We didn’t mind a bit – we’ve had fantastic weather this trip and it’s necessary for us to slow down and find R&R time. In the early afternoon, we traded off watching the kids and getting massages (have I mentioned that my back misses my bed at home and that hiking with 40 pounds of kids and gear is a bit much for my body?) Our afternoon drive to town was a bit of a bust because 90% of everything was closed, but we picked up a few groceries then decided on a long, adventurous drive in nearby Shoshane National Park, a rugged, somewhat uninviting landscape. Along the gravel road, we saw lots of bunnies, people driving horses to trailheads for treks, and even a huge eagle’s nest! We took the Jeep on a couple short 4×4 roads, escaped some mosquitoes and took countless pictures of the badlands as we drove back toward camp. It was getting late, so Raj and Nina went on a date for dinner and I hung out with my little dude, struggled to get him down for bed, and started packing up for our next stop – Yellowstone National Park! Longhorn Ranch Motel and RV: 4.5 stars. This place offers a very pleasant, peaceful stay. Most sites are very spacious, especially exterior sites, and many offer Wind River views. Though we didn’t have a river view, we saw horses graze across the “pond” our site backed up to, and still enjoyed access to the river. It’s not a working ranch, but the location is convenient to Dubois and the rodeo. They’ll contact Reenie for you too, if you’d like a massage, and set you up in a room – she’s pricey but it was a very good massage. The main disappointment for us was the “dog park.” Upon check-in they informed me it wasn’t fully fenced so we’d need to keep dogs on their leashes… huh? Well, then we walked over there and the area is huge BUT not only is it not fully fenced, it hasn’t been mowed in approximately a year; so essentially it’s useless. I’d stay here again – any site on the perimeter, except #1 and #2, would be great. Tovah, I am absolutely entranced with your blog! I can almost see, smell and taste everything you write about, and I can really feel your energy (and lack thereof) when you describe your highs and lows and the excitement of new things. We had been driving through a very small town in Alberta just as a swarm of newly graduated high schoolers came pouring out of a movie house, gleefully throwing the hats into the air. It’s one of those moments that will be forever in our minds. Thanks Gretchen! We will be making our way to Alberta soon! Any tips or must-see places? Reading this. Wow. What an adventure. Love following along with your adventures. Also enjoyed the slideshow. Thanks for keeping up with the blogging! Such a good description of day to day life and ups and downs! Envy you the sights and scenery! Not so much the schlepping and chasing; although we are doing our fair share of that! Another wonderful blog…makes us wish (even more, if that’s possible) that we were traipsing along with you. One comment on Nina’s fear of the auto flush….I get it, she’s too little for it to know not to “flush her”….Good news– there is an easy, universal fix: duct tape. Of course! Just carry a little with you and tape over the little infrared eye before she goes, then don’t forget to remove it and it’ll be just fine. What can’t be fixed with duct tape? Duct tape to the rescue! I’ll try it!